There are several towns in the US called Blackhawk. For example, there is one in Pennsylvania. There is a Blackhawk in South Dakota. There is a Black Hawk in Colorado, and a Black Hawk County in Iowa. But we are concerned entirely with the Blackhawk preschool options right here on the “left” coast in the Bay Area. If you live in Blackhawk (the one in California!) and are looking for Blackhawk, California, preschools, you will be delighted to learn that Learn And Play Montessori has recently opened a preschool right here in Danville, which couldn’t be better placed for Blackhawk families. It’s only 7 miles from Blackhawk to our campus, and then if you commute you are right here on the I680 on your way to work. We are open early in the morning and remain open until early evening, so you can drop your child off on the way to work and then collect him or her again afterwards. We cater for children from 18 months up to six years old. 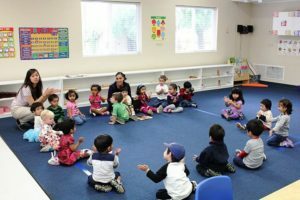 In fact, Learn And Play Montessori in Danville is so convenient that we have children coming to us not only for Blackhawk, California, preschools, but from Diablo, Alamo, San Ramon, Alamo Oaks, and even from Walnut Creek. The classrooms on our Danville campus are light and airy with extended widows to enable as much natural light as possible to enter. They are large rooms filled with Montessori materials of the highest quality for the children to explore. Each child is at liberty to explore all the materials and take and learn from those which interest him. Thus our children learn faster because they are interested in what they are learning: in other words, they learn because they want to learn. This is very different from sitting in a classroom listening to a teacher talking about something which doesn’t interest you. Our children also learn by doing, and they learn to use all their five senses. The classrooms have children of mixed ages in them, and the younger ones learn from the older ones too, which promotes a sense of friendly co-operation. The older children act as role models for the younger ones, which in turn underscores their own abilities and their self-esteem. Each child learns at his own pace, and there is no sense of competition because there are no expectations. The teacher keeps an eye on what the child is doing and learning, and then introduces him to new subjects when it is judged that the time is right. We welcome parents looking for Blackhawk, California, preschools to come along and take a school tour at any time between 9.00 am and 5.00 pm, so please visit us and see how well the children are doing.